When occasion calls for nothing less than best then donning a tuxedo is an ideal option. Nothing makes a man feel more debonair and regal than a tuxedo carried perfectly. To pull off a tuxedo with great style and charm here are some key essentials for you. A pre-tied bow makes a good option if you are running out of time whereas an actual bow tie looks way classy but requires a steady hand and a bit of practice as well. 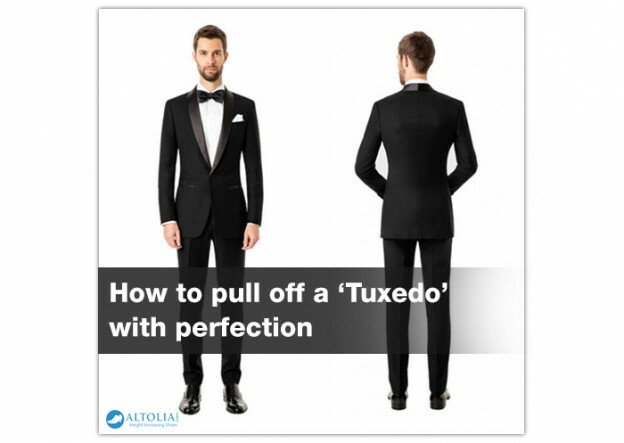 And, if you want to give a modern makeover to tuxedo, then a black tie is the best option. Next thing to decide is, to settle for a stylish lapel. The most formal style of lapel is peaked however a shawl collar also looks equally stylish. In a shawl collar, lapels are neatly joined to the collar making a loop around the shoulders & at the back of the neck. And, if you are looking for a business styled look, notch lapels make a good option. Irrespective of the lapel style you choose, make sure left lapel has a working buttonhole so that if need be you can worn a fancy boutonniere preferably in white or red. It goes without saying, that a spotless white shirt is a key essential when carrying a tuxedo. Shirts that come with a spread collar framing the bow tie, nicely equipped with wing collars and french cuffs makes a perfect fit for a gentleman look. You can also opt for a solid white shirt especially the one with ribs and turndown collar to get a sharp look. The Single-breasted jacket- This is the classiest style that never loses its charm and generally fits all body types and sizes. The double breasted jacket- If you are blessed with a tall frame then a double breasted jacket makes a great option as it comes with a boxy shape and cut. The white dinner jacket- This option is not very popular but when carried nicely definitely reflects that you are a man of taste. 5) Trousers- Trousers are straight forward, whether you want a pleated or plain front that is totally your personal style. If you want have an athletic body type and want a minimalistic look then a plain front is perfect for you. And, pleats also give a sophisticated look and create vertical lines on the front of the leg. 6) Waistcoat or Cummerbund-Waistcoat has a royal traditional charm and is often made of the same material as the jacket itself or either lapels. Whereas a cummerbund is a pleated sash that horizontally wraps around the waist. Whichever waistcoat you choose make sure it conceals the waistband of your trousers all the way around. 7) Shoes-When it comes to making a footwear choice there are many options from a patent leather shoe to nicely polished black leather shoes. You can also go for dressy loafers or formal pumps for a refined and regal look. If you are short in height, then donning a pair of black elevator shoes is your best bet as it will secretly add 3to 5 inches to your height. 8) Accessories- Give a finishing to your attire by placing a folded or puffed white pocket square. Wearing a Watch is Important for these Reasons! Celebrate this Christmas in a Stylish Way! Rock your look in Green Color! Styling Navy Chinos is an easy job! Styling 'Prints' is now easy! Styling 'Chelsea Boots' is now easy!